Asian rooftop gardens are an effective step towards sustainable living and building communities. Residents of high rise buildings in Asia are creating apartment gardens and "bringing gardening to the masses" and relieving the "monotony" of living in concrete. Eighty-two percent of Singapore's 4.5 million people live in tower blocks built by the government Housing Development Board with the rest either in high-rise private condominiums or private houses. In April 2007, Singapore, the "garden city," unveiled its first "green" housing estate with walls of cooling greenery incorporated into its architecture. Beijing has pledged to add 100,000 square meters of roof gardens every year from 2007-2010. Plants lower ambient air temperatures through evapo-transpiration, and by blocking heat from the sun with their leaves. From the scientific point of view, every plant produces a cooling effect. The rule of thumb is one degree less is a five percent energy saving. 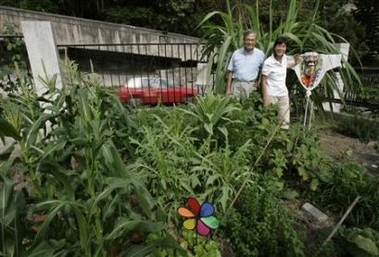 Gillian Murdoch Asia's high-rise gardeners unearth key to cooler cities, Reuters, May 9, 2007.